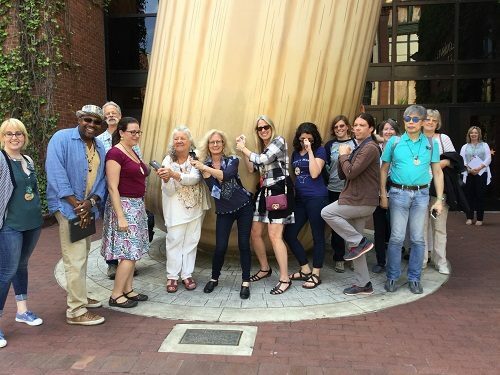 The 2017 Project Learning Tree International Coordinators’ Conference was held April 24-27 in Louisville, KY. Now in its 31st year, our annual conference is designed to provide professional development, networking opportunities, and information about new initiatives to PLT’s partners who deliver PLT programming to educators across the country and internationally, too. The focus of this year’s conference was to introduce PLT’s network to our new online units for Grades 3-5 and 6-8 teachers. These new e-units will officially launch later this month. Read more about PLT’s new e-units. During the conference, PLT Coordinators from around the country, plus Japan and Mexico, as well as other PLT workshop facilitators, and state and national partners, explored PLT’s new e-units in depth. 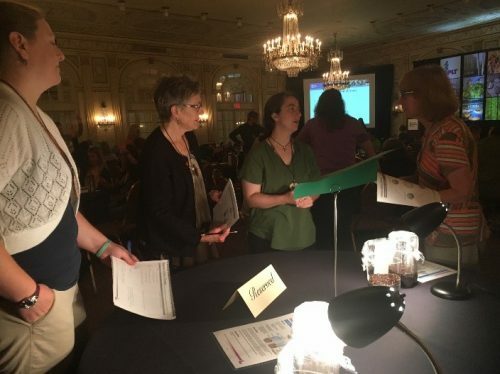 Participants reviewed how the activities have been designed to support student learning progressions, and discovered the added value that the new online format brings, such as the integration of national learning standards throughout. True to the PLT model, educators will receive PLT’s supplemental curriculum in conjunction with a professional development experience. As such, other sessions at the PLT conference provided PLT State Coordinators and workshop facilitators with guidance on how to plan and facilitate high-quality in-person professional development for educators in their state around the new e-units using an outcome-based approach. 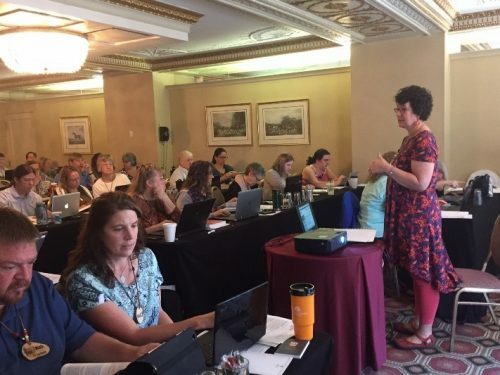 In addition, participants learned about the new online professional development option developed by National PLT and how they might customize each of these three new online courses for educators in their state who are unable to attend an in-person workshop. The cost for each online workshop, that includes access to one accompanying e-unit, is $40. More details about how educators can access PLT’s new materials and professional development will be shared soon. 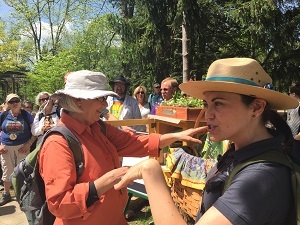 Growing state capacity via partnerships with the American Tree Farm System. 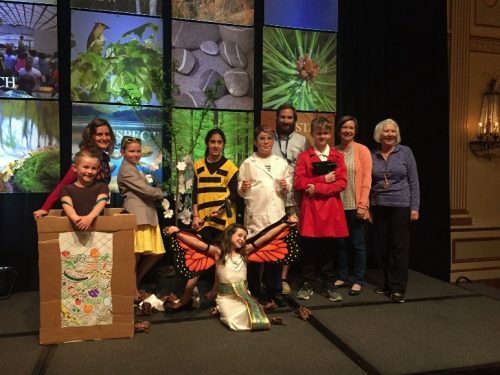 Four PLT state programs shared their outreach efforts, including joint workshops between landowners and teachers, service-learning projects for schools, and programs that bring school groups out to forested land. Identifying opportunities, strategies, and stakeholders to create a state forest literacy plan. 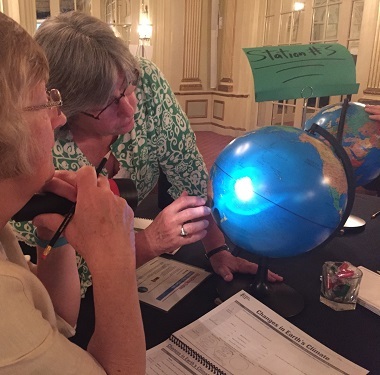 Participants discussed how a forest literacy plan provides teachers a strong foundation to incorporate teaching about forests into their classroom programs, which PLT activities best address a specific forest literacy concept, as well as alignments with state academic standards. Using i-Tree and PLT to help educators and students understand the benefits and measure the value of trees in urban environments. Tree’s Company, a delightful play by 4th and 5th grade students who are members of the Green Team at Virginia Chance School in Louisville, KY that was sponsored by the Albert I. Pierce Foundation. A tour of the factory floor where Louisville Slugger bats are crafted. Bob Russell with Brown-Foreman Cooperages, the makers of Jack Daniel Tennessee Whiskey, Woodford Reserve, and Old Forester Kentucky Bourbons, discussed the role of white oak forests and Kentucky’s forest industry in the bourbon economy. Judy Braus with the North American Association for Environmental Education (NAAEE) gave an overview of all that NAAEE does to support the field of environmental education and discussed ee360 (a cooperative agreement between NAAEE and the Environmental Protection Agency, as well as a consortium of partner organizations, including PLT) that is bringing innovative leaders in the environmental education field together to advance environmental literacy. 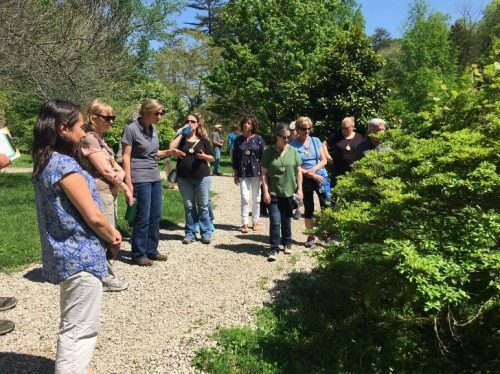 A field trip to the Bernheim Arboretum and Research Forest, the largest privately owned preserved forest in the Eastern United States. We had perfect weather that day and it was glorious to be outside learning how this forest is actively managed, and about the variety of nature-based education programs that include PLT activities available to Bernheim’s more than 200,000 visitors each year. We also witnessed the unveiling of Bernheim’s new “Little Free Library.” Designed by local students and funded by the Albert I. Pierce Foundation, the library features children’s books with an environmental theme. Outstanding Educators — Each year since 1994, National PLT has presented awards to 5 Outstanding Educators and to many other honorees. 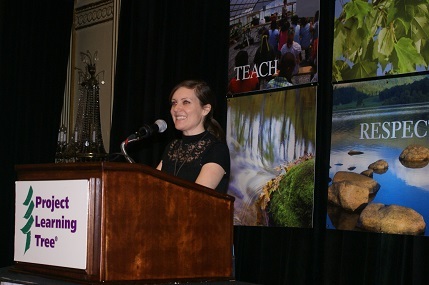 This year’s distinguished outstanding educators are all passionate about PLT and exhibit excellence in the delivery of environmental education. 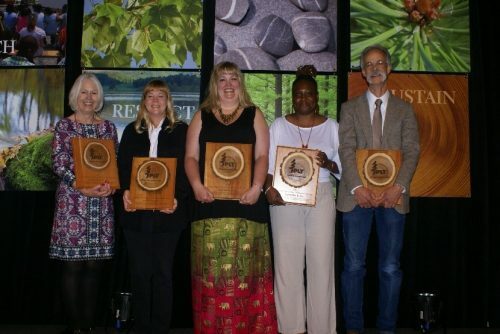 The 2017 National PLT Outstanding Educators are (pictured from left to right): Jana Willis, Ph.D. (Professor and Department Chair College of Education, University of Houston-Clear Lake, Houston, TX), Lori Nicholson (Instructional Systems Specialist, St. Marks National Wildlife Refuge, St. Marks, FL), Debbie Fluegel (Field Coordinator & Program Manager, Trees Forever, Tremont, IL), Tarneshia Evans (Children’s Garden Educator, Lewis Ginter Botanical Gardens, Richmond, VA), and Steve Scharosch (Forest Biometrician, Abacus Enterprises, Inc., Alcova, WY). 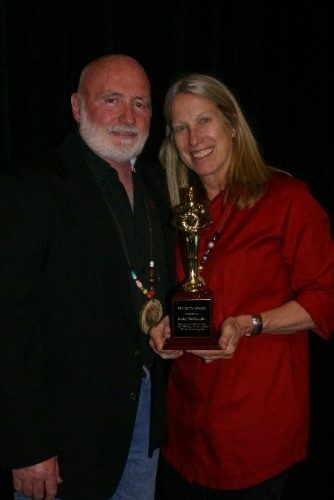 Rudy Award — The Rudy Award, named after Rudolf Schafer who founded PLT in 1976, is PLT’s highest recognition and is only awarded occasionally. 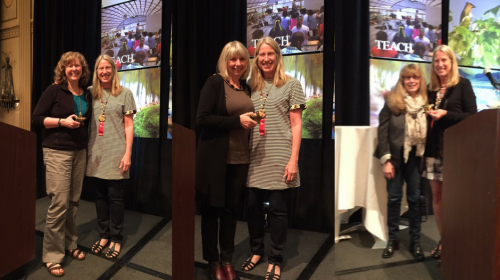 The Rudy Award was presented by Frank Gallagher, Director of Environmental Planning and Design at Rutgers University, to Kathy McGlauflin in recognition of her extraordinary leadership as PLT’s Executive Director for the past 32 years. We gratefully recognize and thank our conference sponsors: ee360; Albert I. Pierce Foundation, U.S. Forest Service, Bernheim Arboretum and Research Forest, Kentucky Tree Farm, and Richmond Beer House. And last but not least, we especially want to extend our gratitude to the Kentucky PLT team for their wonderful job and hard work in helping the national office organize and execute another truly outstanding PLT conference. 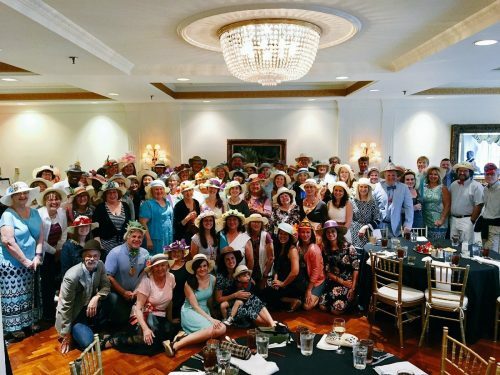 We all had fun making Kentucky Derby hats and bowties to wear at our closing banquet (see below)! For more photos, see our photo album on PLT’s Facebook page.